The UK is in Royal Wedding fever this week with the wedding of Prince Harry to Meghan Markle at the weekend. The current “official” royal family is quite small compared to 30 years ago. Those who don’t undertake official duties, or are more distant descendants of British monarchs, are often referred to as “minor royals”. Today’s subject, Lord Ivar Mountbatten, is one of them, and the closest openly gay minor royal related to Prince Harry. Several historical royal weddings have influenced Ivar’s ancestry. Lord Ivar and Prince Harry share an origin in that their families came originally from Germany. They changed their German names to more English ones in 1917 during World War I. The Royal Family’s name of Saxe-Coburg changed to Windsor, and the Princes of Battenburg changed theirs to Mountbatten. At the same time they renounced with German titles. If it wasn’t for the war Lord Ivar would be Prince Ivar of Battenburg. Many non-titled families of non-British origin also changed their names during the war. Ivar’s great-grandfather was Prince Louis of Battenburg. He and his brother married into the British royal family and became British citizens. Prince Louis became Louis Mountbatten from 1917 and was created Marquess of Milford Haven. His elder daughter Alice had married a Danish prince so remained a princess. Her son is Prince Philip, Duke of Edinburgh. On renouncing his Danish titles to become a British commoner just before marrying the present Queen Philip’s surname became Oldenburg-Schleswig-Holstein – not very English-sounding for someone marrying the future queen just two years after World War II. So he adopted his mother’s family name. That’s why Prince Harry is also a Mountbatten. In the Battenburg roots we find that their princely title comes through another royal marriage. In 1851 Prince Alexander von Hessen married Countess Julia von Hauke. As a German prince Alexander was expected to marry a woman of equal rank, which Julia wasn’t. This type of marriage is called “morganatic” and happened quite a lot, and the wives and children weren’t allowed to call themselves prince or princess. Alexander’s brother, the Grand Duke of Hesse, gave Julia the title of Countess of Battenburg for herself and her children, and in 1858 granted them the titles of Princess or Prince. Battenburg was an old Hesse family castle and, in a way, foretells the British Royal Family’s adoption of the name of Windsor in 1917. Lord Ivar may not even be the first lgbt Mountbatten. One of Julia’s grandchildren became Alexander Mountbatten, Marquess of Carisbrooke (1886-1960). He was Queen Victoria’s favourite grandchild. Several gay high society luminaries, such as Cecil Beaton who knew him personally, acknowledge Alexander as being gay in their diaries. Carisbrooke’s only child, Lady Iris Mountbatten (1920-1982), married an American, Michael Bryan, and the Mountbatten bloodline (but not the name) exists in the USA today in their son Robyn and grandchildren. 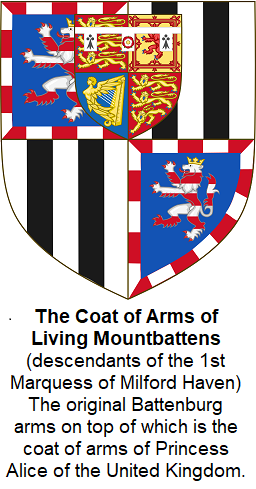 Lord Ivar Mountbatten’s Hesse ancestry can be traced in an unbroken male line all the way back to Reginar, Duke of Lorraine (d.915). Not even Prince Harry can trace his complete male line back that far. Being descended from royalty it’s no surprise to learn that Lord Ivar is a descendant or cousin to gay kings and royals from history, including Edward II of England, James I of Great Britain, Ludwig II of Bavaria, Friedrich II of Prussia, and Gustav III of Sweden. 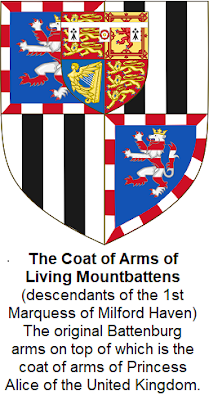 Lord Ivar’s ancestry through his grandmother, the wife of the 2nd Marquess of Milford Haven, is just as grand the Battenburgs and Queen Victoria. It includes another morganatic marriage. Ivar’s grandmother, Countess Nadejda de Torby (1896-1963) was the daughter of Grand Duke Mikhail Mikhailovich of Russia, a grandson of Tsar Nikolai I, who had married Sofia von Merenburg, Countess of Torby. Countess Sofia’s ancestry reveals surprising bloodlines. She was a child of another morganatic marriage. Her father, Prince Nicholas von Nassau-Weilberg, married Natalia Pushkine, who was created Countess of Merenberg. If her surname looks familiar it’s because her father was the famous Russian writer Alexander Pushkin (1799-1837). Pushkin is mentioned in my article on Count Sergei Uvarov. What is a real surprise is Alexander Pushkin’s own ancestry. His great-grandfather was an African slave. Abram Petrovich Gannibal (d.1781), as he is now named, was the son of a tribal chief in what is now Cameroon. The chief was killed in a battle against the Ottomans and Abram was taken as a slave to Turkey, and later to the court of Tsar Peter the Great. Abram’s remarkable rise for slavery to the ranks of Russian nobility is covered extensively in the internet. Pushkin himself was immensely proud of his African ancestry and though his Lord Ivar Mountbatten is of mixed-race descent. So far we’ve only looked at Lord Ivar’s paternal ancestry. His mother’s family tree is just as diverse. Janet Mercedes Bryce married Lord Ivar’s father in 1960. Ivar was named after her cousin Ivar Bryce (1906-1985), who brings another American connection into the family. Ivar Bryce married the grandmother of lgbt activist Julia Pell (1953-2006). While Ivar’s paternal ancestry contains many European leaders, his mother’s reveals many South American leaders. Janet’s grandmother was the sister of Manuel Candamo, President of Peru 1903-4. Through the Candamo’s Lord Ivar is 4th cousin to Manuel Odria, President and military dictator of Peru 1948-56. Lord Ivar’s South American ancestors centre in Peru and Chile. It includes many significant military leaders of the independence movements and colonial governors and mayors. Although I haven’t found any, there is a possibility that Lord Ivar has some indigenous blood, perhaps even Inca. What I have found is that Ivar’s ancestors have been arriving in South America since the days of the Conquistadors in the 16th century. The families in Ivar’s Hispanic ancestry read like a roll call of the leading noble families in medieval Spain – Álvarez de Toledo, Guzmán, Ponce de Leon and Sotomayor, to name just a few. Having such an illustrious collection of ancestors was never going to be surprise in Lord Ivar Mountbatten’s family, but little surprises like Pushkin with his African blood and Peruvian presidential links provide one of the most diverse family trees among the minor royals.